COLUMBIA, Ky. (August 14, 2016) – Tpr. Clint Bale is investigating a collision that occurred on Friday, August 12, 2016 at approximately 11:49 PM CST at the intersection of Chestnut Corner and Sulphur Creek Road. The vehicle, a 1999 Honda 4-door, was traveling west on Chestnut Corner Road when it left the roadway, traveled into a stream and struck a tree. The collision resulted in a fire and the operator was pronounced dead at the scene. The owner of the vehicle was contacted and it is believed that the operator of the vehicle is a family member but an autopsy will be performed to verify the identity of the driver. The collision remains under investigation. 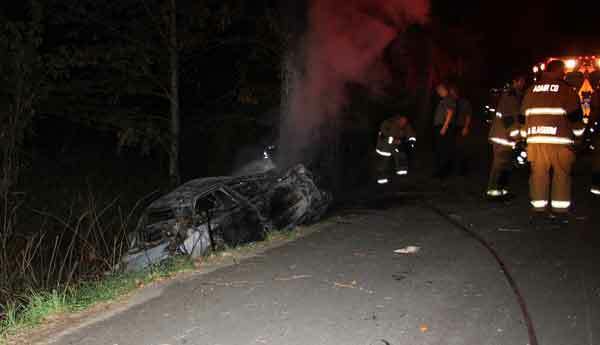 Kentucky State Police has not yet released the name of the person who died in an automobile accident on Sulphur Creek Road Friday night.